Performed By Claire Warden for NYC Playwrights. the annual Mother's Day service at her church. Selected for NYC Playwrights' Worldwide Monologue Project. A substitute teacher shares her experiences working at an inner-city school. 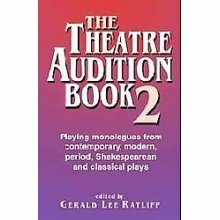 Included in The Theatre Audition Book 2, edited by Gerald Lee Ratliff and published by Meriwether. WAITING FOR HEATHER at Shelterbelt Theatre in Omaha. This work-in-progress is a collection of one-page plays for elementary school children.